Take over our entire building! You get it all...the whole place for just your group. Unlimited Knockerball, a large party room, and an event coordinator who facilitates game after game of non stop action! Its almost as fun to watch as it is to play! - An Event Coordinator That Will Have You Playing Many Different Games As Well As Playing Music! Games Include: Battle Royale, Bubble Soccer, Musical Hoops, Capture The Flag, and more! 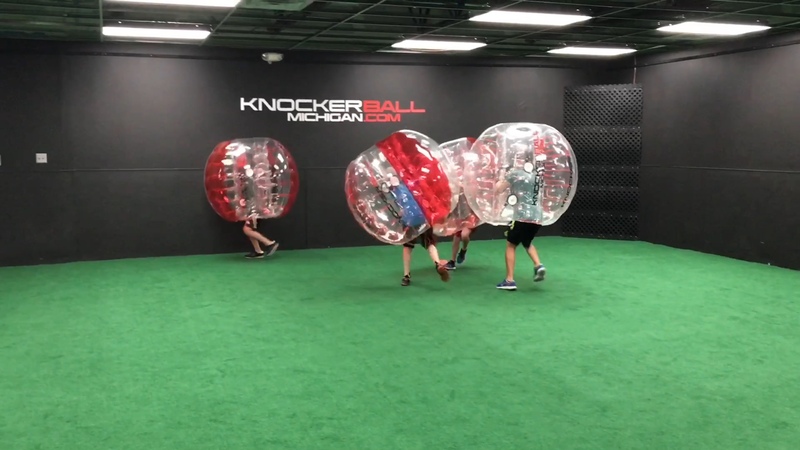 Your private field comes with 12 Knockerballs, a large penalty box for those watching and rotating, and an event coordinator that will show everyone how to use the equipment, and then put on a show that's as fun to watch as it is to play. They will put your group through a series of games designed to knock over your frenids...literally and with laughter, while playing DJ with an amazing sound system. Our party room has several tables to sit at (4-8 depending on the package you choose), a basketball game to play, and three tables for food/gifts/misc. Perfect for holiday parties, team parties, end of season parties, family reuinions, Bar and Bat Mitzvahs, or any large group or gathering! You get it all...the entire building for just your group. Unlimited Knockerball and a large party room. Private Field comes with 12 Knockerballs, a large penalty box for those watching and rotating, and an event coordinator that will show everyone how to use the equipment, and then put on a show that's as fun to watch as it is to play. They will put your group through a series of games designed to knock over your frenids...literally and with laughter, while playing DJ with an amazing sound system. Party room has 4 tables to sit at, a basketball game to play, and three tables for food/gifts/misc. You get it all...the entire building for just your group. Unlimited Knockerball and a large party room. Private Field comes with 12 Knockerballs, a large penalty box for those watching and rotating, and an event coordinator that will show everyone how to use the equipment, and then put on a show that's as fun to watch as it is to play. They will put your group through a series of games designed to knock over your frenids...literally and with laughter, while playing DJ with an amazing sound system. Party room will have 5 tables to sit at, a basketball game to play, and three tables for food/gifts/misc. You get it all...the entire building for just your group. Unlimited Knockerball and a large party room. Private Field comes with 12 Knockerballs, a large penalty box for those watching and rotating, and an event coordinator that will show everyone how to use the equipment, and then put on a show that's as fun to watch as it is to play. They will put your group through a series of games designed to knock over your frenids...literally and with laughter, while playing DJ with an amazing sound system. Party room will have 6 tables to sit at, a basketball game to play, and three tables for food/gifts/misc. You get it all...the entire building for just your group. Unlimited Knockerball and a large party room. Private Field comes with 12 Knockerballs, a large penalty box for those watching and rotating, and an event coordinator that will show everyone how to use the equipment, and then put on a show that's as fun to watch as it is to play. They will put your group through a series of games designed to knock over your frenids...literally and with laughter, while playing DJ with an amazing sound system. Party room will have 8 tables to sit at, and three tables for food/gifts/misc. No basketball game with this package. We are available almost any day and time by reservation. To book our building, fill out the form below with HOLIDAY PARTY in the subject line, along with what package, date, and time you would like, and we will respond promptly with availability and to confirm the details!